Another gorgeous tune from the Ukrainian front. While watching one of the wonderful, breath-taking and thought-provoking videos out there these days, a couple of things occurred to me. First, that the dance steps in Ukrainian dance, in particular of the men, were developed with more practical purposes than for entertaining audiences on a stage. They were, literally, moves designed to save a solder's life and for defeating a murderous enemy. In the last half of the 20th century, and the first couple of decades of the 21st, the origins of the dance moves were but a distant memory, interesting footnotes in the history of Ukrainian dance. Now of course, the circumstances that led to the development of those dance moves are no longer a distant memory, but today's stark reality. So my second thought is how today's Ukrainian freedom fighters will be mythologized long after we're all gone from this earth. Hand to hand combat is pretty much a thing of the past now, thanks to the horrible weaponry developed in the last century. So intimidating posturing and clever kicks won't be of any use to today's kozaky fighting for Ukraine's freedom. With the resurgence of folkloric symbols and musical styles, probably the dance moves will remain, albeit modified somewhat by modern choreography. But the rest of it ... the songs, the symbolism, and the sentiments ... these should be recorded for posterity. It's a different world, and not just because of technology. It's the attitudes and mindsets that technology empowered. I believe in my heart of hearts that Ukraine may, for the first time in centuries, be able to break the yoke of foreign oppression, once and for all. So we should all chronicle this time in our lives. We should keep meticulous records, digital or analogue (or both), for future generations to understand better than we ourselves do, being in the middle of it with only an eye of the storm view. Perhaps if, with details chronicles and records, we can help them step back in time, we can help them avoid the mistakes that we have made, and are bound to make before this is all over. I'd be interested to see if this video inspires you as it did me. Enjoy. Lyrics and translation below. And the song was heard about their fate. About their fate, and about the price of freedom. The Cossacks rode, singing songs. And the songs of their sweethearts rang throughout the meadows. Because she gave her love to a young man. This morning I received a Skype message that tugged (well, tore) at my heart. It was from Orest, in Ukraine. He originally emailed me a few months back, soliciting support for his charity, and we ended up connecting on Skype. His English and my Ukrainian are at about par, so our conversation was a bit rough around the edges. However, this time I could understand him just fine. І крилами лелеки, повернуться живі! Мати, син, калина, лелека - святі речі для кожного українця. Слухаючи цю пісню нагортається сльоза. Пісня "Біля тополі" з документального фільму "Рейд" Відомий польський гурт Enej присвятим воїнам, що загинули за свободу та незалежність України, пісню. And on the wings of a stork, return alive! This song will bring tears to your eyes. It is called "Near the Poplar" from the documentary film "Raid." The famous Polish group Enej (Aeneas) dedicated this song to the soldiers who died fighting for the freedom and independence of Ukraine. Having never heard of this film, I decided to see what I could find out about it. What I found out surprised me ... Raid is about the popular video game World of Warfare. In the video below, the young man speaking before the song starts reminds me very much of a "Cyborg" I visited in a Kyiv hospital last spring. His name is Vadym. He was caught in an ambush during a real-life raid in Debaltseve. He survived, fortunately, albeit without his arm and both legs. I'll share his story here soon. In the meantime, enjoy the song that Orest sent, in memory of those who did not survive the real-life raids unleashed on Ukraine by their Russian "brothers." The song is Біля Тополі - Near the Poplar, by Polish group Enej (Aneas) joined by popular Ukrainian artist Taras Chubai. Слава Україні ... Слава героїм! While in Lviv, I had the great privilege to spend time with two women from Crimea – one a Tatar, one Ukrainian. Dr. Gulnara Bekirova was one of the speakers at the UJE conference in Kyiv. She is with the Special Kurultai Commission for the Research of Crimean Tatar Genocide, Ukraine. She spoke (in Russian btw, with no ill effects) during the session entitled The ‘Traitor Nation’and the Destruction of the Crimean Tatar Civilization. The other was her friend who survived deportation to the Urals. Dr. Bekirova’s friend joined us in the lobby of the Swiss Hotel, where the UJE entourage was staying. Much of the conversation was private and personal ... including finding uncanny personal connections. (She even thought I looked familiar!) So much for the proverbial "six degrees of separation." For anyone with a Ukrainian connection anyway, it's usually 2 or 3 at most! Earlier, I had a rare opportunity to chat with Dr. Bekirova over breakfast. There was a bit of a language barrier as she speaks “Surzhyk” (a mixture of Russian and Ukrainian) and I speak просто (kitchen) Ukrainian. I bitterly resent the language barrier, but appreciate learning what I did from that discussion, and the meeting with her friend later. Fortunately our intrepid leader, Raya, joined us at breakfast and kindly translated when I got stuck. Dr. Bekirova told us that life in Crimea is dangerous now—for everyone, but especially for ethnic Ukrainians and Crimean Tatars. She lives in Simferopol, Crimea and publishes children’s books in the Crimean Tatar language, so that the language and culture survive. So far she has managed to stay out of the cross hairs of the occupying Russians. When the occupation began and the Ukrainian army was still in Crimea, the Tatars brought the soldiers food and other supplies, and begged them not to leave Crimea, but to stay and protect them. As we know, the Ukrainian forces were overpowered by the Russian army and Putin’s green men, which are now occupying the peninsula. She told us that there are only about 600 Ukrainians left in Crimea. Those she knows are too afraid to speak Ukrainian in public. When I visited Crimea with family members on a tour in 2008, I recall that it was rare to hear Ukrainian spoken... unless you initiated the conversation. Then it was all smiles and the Ukrainian came out! I did detect a bit of nervousness in the people we spoke Ukrainian with, but not outright fear. Perhaps from 2008 till 2014, some progress had been made in Ukrainian language rights in Crimea. But Putin has obviously reversed that. During breakfast and over coffee we spoke about her work as a children's publisher and cultural activist, and what we learned from her presentation at the conference in Kyiv about the little-known genocide of Crimean Tatars in 1946. At one point she said how nice it would be to have a similar conference in Crimea. I found that quite surprising, given the situation in her homeland. There is no way UJE (or any diaspora organization) would even remotely consider the risk.Plus, imagine the logistical nightmare of housing, feeding and transporting conference participants—the tourism industry in Crimea isn’t exactly thriving under Russian occupation. Organizing a conference is complicated and stressful at the best of times, as it was even in Kyiv and Lviv, where life is (more or less) normal. Maybe it was just wishful thinking on her part, or perhaps a bit of denial of the reality of what Crimea has lost, and how difficult (or unlikely) to ever regain and rebuild it. The conference session in Kyiv on the Tatar deportation, as well as the delightful private conversations with Dr. Bekirova, her friend, and a young Muslim man who briefly joined our entourage, increased my awareness of the Tatar people in the Ukrainian national fabric, if not my knowledge. It’s embarrassing to admit how little I know about the Crimean Tatars. Somehow they were just kind of always there, a fixture of Ukrainian history that was just “part of the woodwork.” Not unlike, perhaps, the First Nations here in Canada. I’m looking forward to exploring this new topic in Ukrainian history! Dr. Gulnara Bekriova and me at breakfast in the Swiss Hotel in Lviv. she could easily be mistaken for First Nations from the west coast. Some of the yummy breakfast food we enjoyed. Lots of fresh fruit, pastries, fresh dairy, meat, fish, cereals, etc. And of course the ubiquitous tomatoes and cucumbers. Oh, and coffee to die for! One of Dr. Bekirova's children's books. Kids books by Dr. Bekirova. who attended the conference in Kyiv and Lviv. what took place at this site. Details in another post. Here are some pictures I took in Crimea while visiting back in 2008. I was struck by the similarity in the topography to the west coast of Canada. I felt very much at home driving through the mountains and trees there! I hope one day it will be safe to return to visit Crimea, and that the people living there will be happy and free—regardless if they are Crimean Tatar, ethnic Ukrainian, ethnic Russian ... or ethnic Martian for that matter. it almost felt like I was back on the west coast of Canada! Near where the historic Charge of the Light Brigade took place. We toured several palaces in Yalta ... built by Russian monarchs. Iconic Kobzar at Yalta palace 2008. I wonder if he survived Russian occupation? View of the Black Sea from my hotel room. View of Hotel Yalta from Black Sea beach. preferred swimming in the hotel's lovely, enormous salt water pool. On the tour bus with Mom 2008. 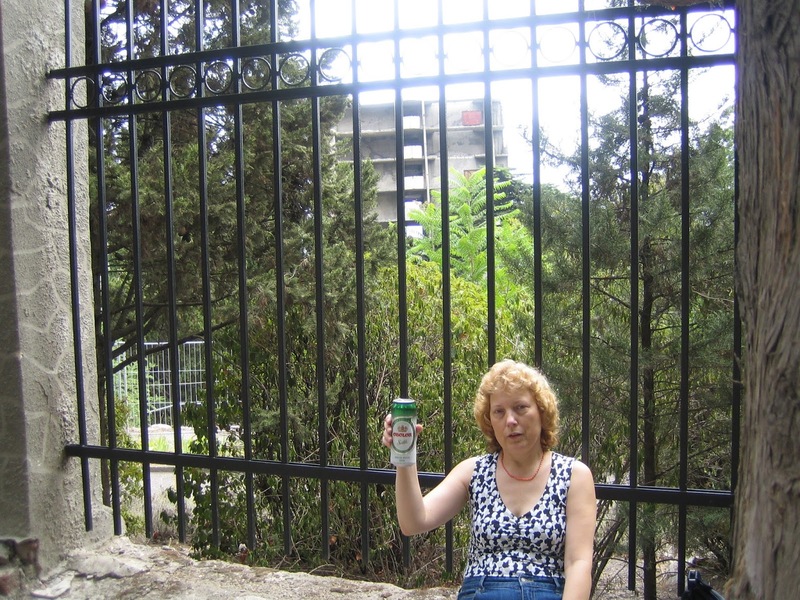 Enjoying a beer while strolling into the town of Yalta from hotel. Some of the girls needed new shoes for the ballet that evening. Outside the ballet theatre in Yalta with sisters and nieces. Inside the ballet theatre in Yalta. Dinner in the Yalta Hotel. Photo op requested by fellow tourist (local). Crimean Tatar palace. Very different from the palaces in Yalta. melt-in-your-mouth. Reminded me of a giant ball of khrustyky! Getting provisions for 25-hour train trip from Simferopol to Lviv-Sept2008. On the way to the train station in Simferopol. Don't imagine any Golden Arches there now. Hope one day to revisit. I can't take credit for this video (found it on YouTube) but thought I would share it with you. It's extremely well done, and the visuals are gorgeous. 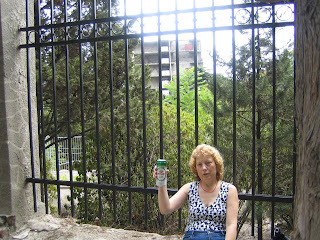 If you've been to Kyiv you will recognize some of the sights, as I certainly did. If you haven't yet, then they may just make you think about taking a visit to this amazing and beautiful city. Just as I was leaving for Toronto and Ukraine, I received an email message about a project called Helping Hand for Ukraine and an upcoming training seminar for health care professionals dealing with children traumatized by the war in eastern Ukraine. The message was from Oksana Oliynyk who works with HOPE worldwide Ukraine, which is one of many such organizations affiliated an international NGO recognized by the United Nations and operating in 75 countries on all six continents. HOPE worldwide of Canada is raising funds here in Canada to support the Helping Hand for Ukraine programme. This project will train some 300 psychologists, social workers and teachers to help war-traumatized children and parents, as well as deliver humanitarian aid to internally displaced persons (IDPs) who live in temporary camps (Cherkasy, Korostyshiv, Kurakhove, Komsomolsk, Kremenchuk). I hope to have someone from the organization on Nash Holos to discuss this project in more detail, and how Canadian listeners can help. Meanwhile, here is an English translation of the press release she sent out about the training seminar. Kyiv, May 25, 2015 – The first training for trainers for the “Helping Hand for Ukraine” project of “HOPE worldwide Ukraine” Charity Foundation took place in Kyiv on May 22-24, 2015. Ten practicing psychologists and psychotherapists participated in the training. During the three days, participants learned how to use the manual and program: “Children and War: Teaching Recovery Techniques” in their work with traumatized children, particularly with those traumatized by the war in eastern Ukraine. Conducting the training were professional trainers and supervisors Ms. Lyubov Loriashvili (practicing psychologist, leading specialist at Kyiv City Center of Social Services for Family, Children and Youth) and Ms. Nataliya Podolyak (trainer of “Children and War: Teaching Recovery Techniques” program, practicing psychologist and psychotherapist at “Dobrobut” Medical Network). The “Children and War: Teaching Recovery Techniques” program was developed by the Center for Crisis Psychology (Bergen, Norway) and the Institute of Psychiatry (London, Great Britain). In Ukraine, the manual has been translated and adapted by experts from the Ukrainian Institute of Cognitive Behavioral Therapy (Lviv, Ukraine). In June-July 2015, the newly trained trainers will use the acquired knowledge and practical skills during the pilot stage of “Helping Hand for Ukraine” project in Korostyshiv. They will conduct therapy sessions for children, who witnessed and survived the war in the Eastern Ukraine. Within the framework of the project, the trainers’ team will also teach psychologists, social workers and teachers all over Ukraine how to work with the “Children and War. Teaching Recovery Techniques” program and manual. Snizhana Volokh, training participant, practicing psychologist: “Each training day was intense. We learned different techniques to work with memories surrounding traumatizing events. We tried all of the techniques on ourselves working with images and visions. We were trying to understand that we could control them in our imagination. Every participant also got a chance to try out the role of the trainer. At the moment, we are full of emotions and new knowledge which will soon be used in our further work with children”. Lyubov Loriashvili, trainer and supervisor of the “Helping Hand for Ukraine” project: “I think everyone in Ukraine has to learn this program – schoolteachers, kindergarten educators, parents, volunteers. If the children do not get assistance now, in future the state will have to spend a lot of money for their treatment and therapy, work with their future kids and families. Therefore, I am convinced that everyone, everyone in our country needs to learn this program”. The “Helping Hand for Ukraine” charity project includes the training of 300 psychologists, social workers and teachers how to work with traumatized children using the “Children and War. Teaching Recovery Techniques” program and manual, therapy sessions for children and parents to acquire skills and capacities to deal with their traumatic experience, delivery of humanitarian aid to internally displaced persons (IDPs) who live in temporary camps (Cherkasy, Korostyshiv, Kurakhove, Komsomolsk, Kremenchuk). “HOPE worldwide Ukraine” Charity Foundation is a non-governmental charitable organization, performing its activities in Ukraine, which aims at improving the quality of life for children and adults who live in difficult socio-economic conditions. The Foundation has been registered in 1998 (Certificate #0108-98 issued by the Ministry of Justice of Ukraine). The main activities of the Foundation include providing humanitarian aid to the IDPs (internally displaced persons) from the Eastern Ukraine and psychological assistance to children, traumatized by war in the Eastern Ukraine; fostering social adaptation of orphans with disabilities who live in orphanages and boarding schools in city of Kyiv and Kyiv oblast; assisting state elderly care institutions in sustaining physical and emotional needs of the elderly; promoting healthy lifestyles among adolescents and youth; promoting voluntary blood donation and recruiting blood donors. HOPE worldwide of Canada – is a registered non-profit charity, headquartered in Toronto, Ontario and is affiliated with HOPE worldwide Ltd, a non-profit charity, headquartered in Philadelphia. We share HOPE worldwide's mission, which is as simple as its name: “to bring hope to a hurting world”. HOPE worldwide was founded in 1991 with just three simple programs. Now it serves the poor in 75 nations on all six inhabited continents. With over 100,000 committed volunteers, HOPE worldwide annually serves more than 2 million needy people worldwide. HOPE worldwide is a recognized non-governmental organization in special consultative status with the Economic and Social Council of the United Nations. HOPE worldwide of Canada has been recognized by municipal, provincial and federal governments for its programs and committed volunteer base. Well this skit seems to be prophetic. Lately I'm regretting leaving the airline industry. Being an "insider" is still the only way to get any decent customer service. Being a peon of the travelling public these days it doesn't matter which airline you fly with. They're all bad ... and occasionally good. In total contrast, my rebooked flight on Air Canada YYZMUC was outstanding, one of the best flights of my life overseas. But I'm back to being disgruntled with AC (not an IRATE PAX yet, just shaking my head). I just booked a flight to Winnipeg at their website, and in order to add my Aeroplan number need a password. Good grief. Couldn't remember it, their automated password retrieval system said my birthday entry was wrong (!) and I hung up from the help line after sitting on hold forever. Sigh. A trip down memory lane I could do without. What I hated about working in the industry, and the reason I left, was the pathetic systems that prevented human beings from providing decent service to paying passengers. The well-paid bean counters and suits had no interest in efficient systems and common-sense approaches for customers and front-line staff 20 years ago, and it's obvious from a passenger's perspective that it's only gone from bad to worse. So I am very grateful whenever I'm lucky enough to encounter airline staff who provide good customer service ... like the AC cabin crew and ground staff in YYZ and (to be fair) the BA cabin crew on my flights home ... and my former TZ/PW/CA/AC co-workers (who unfortunately are retiring in droves now). It's definitely an effort on their part ...basically an act of civil disobedience against Management. So I've resigned myself to expecting the worst, and hoping for the best (to quote an old supe named Barry), whenever I fly. The third day of the UJE international seminar “The Seduction of Propaganda: Mass Violence in Ukraine in the 20th and 21st Centuries” took place in Lviv on June 5, 2015. The Ukrainian Jewish Encounter created a video with highlights of the day. It includes shots of the conference sessions, goings on before and in between (including me interviewing some young cadets! ), and a city tour of historical sites commemorating the victims of genocide, Jewish and Gentile. Details and reflections to follow, but meanwhile here's the video. Time is 10:21. The narration is in Ukrainian (mostly the tour leader and the host of the seminar). It's been another long time since posting here... and my apologies. It's been a while blogging and I have a new appreciation of the skill it took! Not to mention the routine I lost in the process of getting out of the blogging habit. So I am going to get back into it ... not least of all to lose the new moniker of SB ("Sh**ty Blogger) my brother in law gave me. He was the inspiration to resume blogging with this trip... and, apparently, to get back into the habit. So Collin, thanks for the kick in the backside! Also thanks to my writing role model and friend, Marsha Skrypuch, for giving me one as well. To be fair to myself, this trip was emotionally and mentally exhausting. Also, the pace was grueling. LOL Not that I'm complaining, tho! It was an exciting and fascinating experience, and extremely rewarding. I'd like to thank the Ukrainian Jewish Encounter Initiative for making this trip possible. I stopped off first in Toronto for a few days, then spent 16 days in Ukraine. I learned so much, and met so many wonderful people ... some have become new friends, some were cyberfriends that I finally met in person, and some were "old" friends I hadn't seen in years. As well, along with the new information, I have fantastic memories to share with my listeners, readers and followers. There was so much happening and the time just flew! The conference sessions made my head spin. They were so packed with new information and also filled in gaps of my own knowledge of the subject matter, of which I have been a lifelong student. And when I wasn't conferencing, I met and gadded about with the most interesting people! Well, "interesting" doesn't begin to describe my UJE hosts and fellow travellers. I was thrilled and honoured to be able to spend time with some very prominent, world-renowned scholars and experts in the field of genocide and propaganda, some whose work I studied in university and later. Ditto the incredible people I was with on my "free" days. In Kyiv I met radio colleagues and guests I had interviewed by phone, who have since become dear friends. (Thanks in large part to Vasyl Pawlowsky, who I swear knows just about everyone in the world!) I had some great times in the iconic Kupidon bar where I met some fascinating people doing amazing things. I also had the honour to meet some of the Heroes of Ukraine who are defending freedom and their fledgling democracy. The conference that UJE hosted was intended for youth, and it was entitled The Seduction of Propaganda and Mass Violence in Ukraine in the 20th—Beginning of the 21st Centuries. 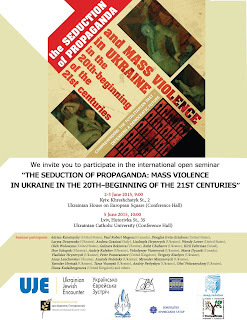 It was a 3-day conference which took place in Kyiv June 2&3rd at Українскйи Дім (Ukrainian House), and in Lviv June 5th at the Ukrainian Catholic University. Conference posters were visible from Khreshchatyk Street. Many cadets and military students at this youth conference. The sessions were conducted in English, Ukrainian and Russian. Translation was available, hence the headsets. This session would likely have been presented in English. co—director of Ukrainian Jewish Encounter Initiative. in Ukrainian House for this conference. The first day of the conference focused on genocide and the role that propaganda played (and still plays) in state-sanctioned mass murder. Several presenters described and explained the techniques and strategies of propaganda, which basically don't change much ... except in appearance and the use of new technologies of the time. Three genocides were addressed: The Holodomor of 1932-33 in Ukraine, the Jewish Holocaust of WWII, and Stalin's deportation of the Crimean Tatars in 1946 (which admittedly I was only vaguely aware of). Once you have learned the propaganda techniques, it is impossible not to see the parallels from one genocide to the next, despite the different imaging based on the target victim groups. Unfortunately, the reverse is also true. If you have not learned them, you will not recognize them. And sadly, you will think those who do have lost their minds or are just paranoid conspiracy theorists. Which is exactly what those waging the propaganda war need in order to win. And, literally, get away with murder. So last week, while I was in Lviv, I ended up on the other side of the microphone. I was a guest of Keith Perron, who shone his audio spotlight on Russian propaganda on his internationally syndicated radio show Media Network Plus, a weekly look at the world of communications. In the first 15 minutes he takes a little trip down memory lane with an anecdote by a colleague and clips of Radio Moscow from back in the day. In the second half, Keith and I discuss (via Skype) contemporary propaganda (particularly as it affects Ukraine), and some of the information and insights revealed at the conference I attended in Kyiv and Lviv on propaganda and genocide. 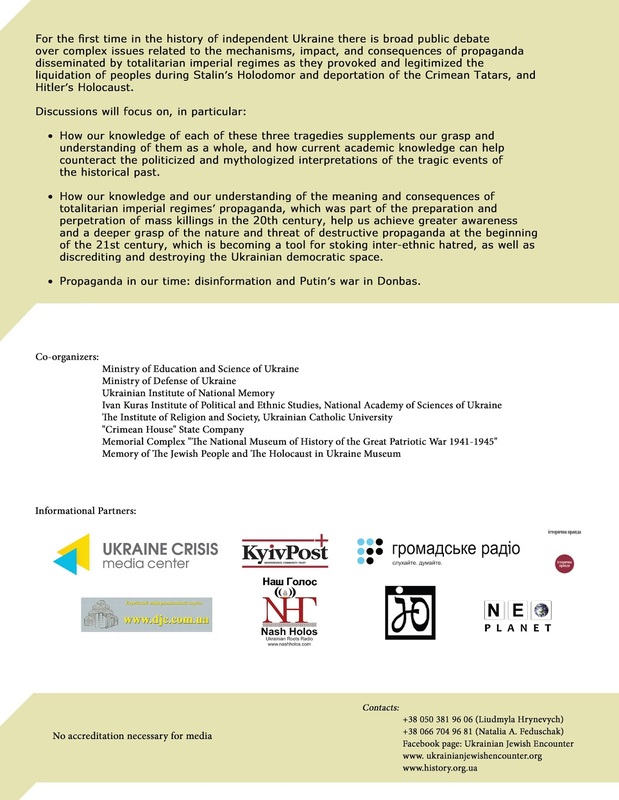 The conference, entitled The Seduction of Propaganda and Mass Violence in Ukraine in the 20th and early 21st Centuries, was organized and hosted by the Ukrainian Jewish Encounter Initiative. (UJE is the generous sponsor of the Ukrainian Jewish Heritage radio series on Nash Holos, as well as my trip to Ukraine). One of the speakers at the conference was Peter Pomerantsev, who I think has some of the sharpest insights into the propaganda coming out of Moscow these days. Other speakers included outstanding scholars from Europe and North America, who deconstructed the propaganda of the past, and illustrated how effective it was in justifying genocide based on three glaring examples: the Ukrainian Holodomor of 1932-33, the Jewish Holocaust, and the 1946 Deportation of Crimean Tatars. Deconstruction details (and more) to come in the near future. In the meantime you can get a general overview of my impressions part-way through the conference in my 15-minute chat with Keith on Media Network Plus here. Lviv is considered the "Paris of Eastern Europe" ... it is also somewhat reminiscent of Vienna. It's a city that is hard not to love, and it's wonderful to be back here. My apologies for the gap in posting updates here on the blog. It's been an incredible, intensely busy time since the moment I stepped onto Ukrainian soil! There is much to tell you about what transpired in Kyiv, and that will come a bit later. I have tons of notes and footage to process first! But I thought I should let you know that I'm safe and sound in Lviv. It was a bit of a traumatic time getting here. Just before we boarded the train in Kyiv, I discovered my wallet had been stolen out of my purse... probably while navigating the steps down to the train. Boo!! Stupidly, I had all my cash in the wallet as well as my driver's license, my Blue Cross & Care Card, and a couple of credit cards. Needless to say that did not get the day off to a very good start! But, it could have been a lot worse. Although life is more or less normal outside the war zone, people in this country do get abducted, tortured, and killed, I'm just out those few things. Plus, I am not alone. I have been lent cash and many shoulders to cry on. And, I have my passport, So apart from feeling very stupid for being so careless with my wallet, I'm having the time of my life on this trip. During the seminar in Kyiv and Friday here in Lviv I was crazy-busy on site taking notes, photos and audio-visual recordings. The seminar is over now and I am getting a chance to start to process some of it before the next crazy phase on this trip. Today (Saturday) was a "catch-up" day so I slept in a bit and did some shopping and wandering around downtown Lviv. Sunday evening we head back to Kyiv, then Monday we take the train for an overnight trip to Dnipropetrivsk where will will tour the world's largest Jewish cultural institution. Meanwhile, here are some street scenes from beautiful Lviv, in western Ukraine. It is not uncommon to see a strip of вишивання (traditional embroidery patterns) on cars in Ukraine these days. Menu at the Fresco restaurant .. check out "Ukrainian abundance" ... apparently it is not a joke after all! potato, cottage cheese and onion, but dough made of whole wheat instead of white flour. Tasty! A spiffy new trolley bus ... brand new. Street scene ... musicians on bench playing traditional folk songs. One of many streetside patios. Saw this army vehicle on the big central boulevard on the way to the art market behind the Opera House. Another stark reminder that this is a country at war. Gorgeous knicknacks at the art market. Street scene from the patio of the Atlas restaurant.